Asia’s 50 Best Restaurants 2019: Which Thai Reps Made it to the Top? Bangkok’s buzzing gourmet scene is welcoming a fine-dining experience unlike any the city has ever seen. Premium winery Château Palmer and Le Du invite fine-dining and wine enthusiasts to a unique six-hands wine dinner, led by three of Asia’s rising star chefs — Jordy Navarra of Toyo Eatery, Richie Lin of Mume, and of course, Bangkok’s very own Thitid “Ton” Tassanakajohn of Le Du. Titled ‘Asian Fine Gastronomy & Palmer’, the experience will see each chef showcase their unique craftsmanship, using only seasonal and local ingredients. Fascinating dishes like ox tongue, and fish sauce with chocolate will be complemented by fine wines of Château Palmer dating back to 1995. While wines are mostly associated with food from the West, this dinner showcases the potential of Asian cuisine, and how it complements fine wines. It also brings to light the possibility of enjoying an exquisite gastronomy experience, while being sustainable at the same time — a shared value strongly upheld by all three chefs and Château Palmer. 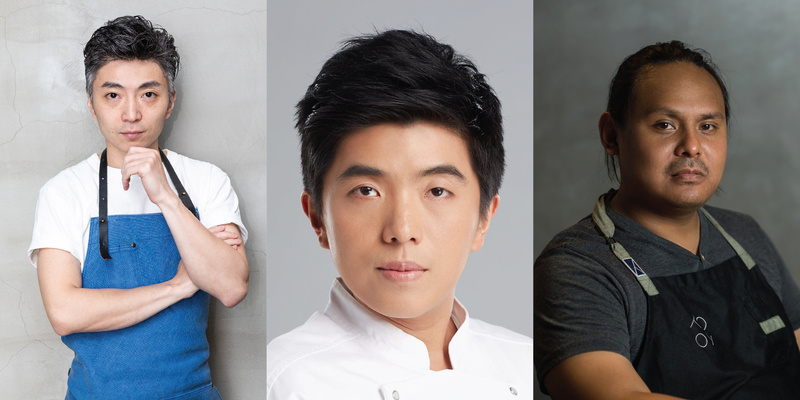 Before the big day, Prestige had a quick chat with each of the participating chefs, to get to know the faces behind these great establishments in Asia. 1. He majored in history, with a baseball scholarship. 2. Dishes served at his establishment, Toyo Eatery, are more ‘raw’ than they are pretty. “We try to represent Filipino food in a way that both outsiders and Filipino people can understand. We focus on quality and good presentation, but we don’t try to make ‘artwork’ on the plate — our approach is a “raw” approach.” Authenticity aside, Toyo Eatery also tries to be as biodynamic and fair-trade as possible. Relyenong Pusit: Vinegared rice is stuffed into baby squid heads, then garnished with mustasa (mustard flower). 3. One of his most famous dishes was transformed from a local nursery rhyme. Proof that creative inspiration can come from anywhere — even traditional folk songs sung during youth. “[The dish’s] story comes from a Filipino song that everyone learns as a child, called ‘Bahay Kubo’, which is about a house with a garden. In this song, eighteen vegetables are enumerated, so we decided to transform this song into a dish that would incorporate all those 18 vegetables. 1. Nature-driven, sustainable dining is his go-to philosophy. 2. His restaurant might be in Taipei, but he isn’t Taiwanese — neither is his food. 3. He still remembers the first time he had wine, and has high hopes for encouraging wine-pairing with high-end Asian cuisine. Thitid “Ton” Tassanakajohn from Le Du, Bangkok. 1. He might have trained and worked in the most prestigious restaurants of NYC, but his heart is Thai. 2. His establishment, Le Du, serves a lot more than pretty plates — it serves a philosophy. 3. To chef Ton, the ‘Asian Fine Gastronomy & Palmer’ is a dinner that will make a difference. ‘Asian Fine Gastronomy & Palmer’ will take place from 6pm onwards, at Le Du Restaurant on January 23. To find out more, please contact damiengrelat@chateau-palmer.com, or info@ledubkk.com. The online content creator for Prestige Thailand, Mary handles the magazine's digital platforms. She enjoys black coffee, astro charts and listening to entire albums in one go. When not engrossed in a novel or having brunch, catch her on the hunt for new restaurants and the city's latest happenings.